Transhumanists say there is a growing awareness and interest in using technology to enhance or supplement physical capability. Some critics point out the risks and the potential to exacerbate social inequality. 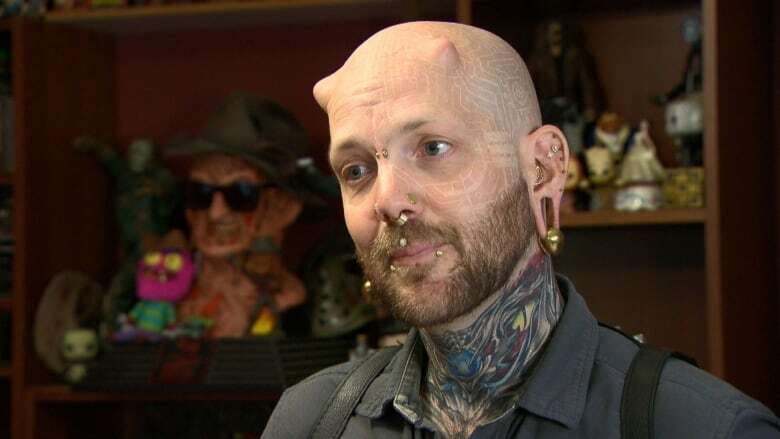 "I like the idea of upgrading myself, enhancing myself in different ways so that I can interact with the world around me in more ways and I can increase my sensory capabilities," he said in an interview at Vancouver's Harbourside Tattoos, where he works. His body modifications include devices — surgically implanted beneath his skin — that allow him to share electronic data, unlock cabinets and doors and even sense magnetic fields. Foxx says humans have long used technology to make up for physical limitations — think of prosthetics, hearing aids, or even telephones. More controversial technology aimed to enhance or even extend life, like cryogenic freezing, is also charted terrain. The transhumanist movement isn't large, but Foxx says there is a growing awareness and interest in technology used to enhance or supplement physical capability. This is perhaps unsurprising given that we live in an era where scientists are working to create artificial intelligence that can read your mind and millions of people spend most of their day clutching a supercomputer in their hands in the form of a smartphone. It's a topic that's becoming increasingly ubiquitous in popular culture, in shows like Altered Carbon and Black Mirror. "I think the future is going to hold a lot more transhumanists," Foxx said. But where advocates like Foxx mostly see the benefits of transhumanism, some critics say it raises ethical concerns in terms of risk, and others point out its potential to exacerbate social inequality. Foxx admits that he stands out in a crowd — he has made more than 100 modifications to his body, ranging from relatively mundane elements like piercings to more taboo ones like a surgically split tongue. He also has silicone implants in his forehead that look like horns — there strictly for aesthetic purposes. "When I'm in public and I meet people ... sometimes they don't know what to make of me," he said. Body implants like the transponder on the back of his hand will be one of the topics at a conference this weekend in Pittsburgh, Pa., where a "body hacking" convention is taking place to showcase the latest developments in "human augmentation." The schedule includes how to program implanted computer chips and a workshop called "Hacking hormones as biotechnical resistance." Bioethicist Anna Wexler, a post-doctoral at the University of Pennsylvania, will be speaking at the event. For some devices, Wexler says, there is little in the way of federal regulations or studies to demonstrate effectiveness or potential long-term risks. "I think [transhumanists] have a right to modify their own bodies as they see fit," she said. "I think ethical questions start to come in if people are either selling services or devices with some sort of claim and maybe those ... have not been appropriately vetted." Sociologist Nicolas Le Dévédec, an assistant professor at the business school HEC Montreal, is more pointed in his critique on the subject. Le Dévédec says transhumanism is a capitalist response to a society focused on individual performance. Instead, he suggests, we may want to question social norms that compel people to perform past their physical limitations in the first place. "In a society with a cult of high performance, the liberty to say no [to technology] becomes difficult," he said. Those who do say no, he says, risk being ostracized — and disadvantaged if they can't keep up to artificially-inflated standards of productivity and performance. With files from Nora Chabib.